FAA personal electronics devices rule changes won't affect all passengers yet. But despite that announcement, the use of electronics below 10,000 feet remains prohibited on almost half of the airplanes that operate domestic Delta flights. Through the rest of this year, it’s still possible to fly Delta and get yelled at for using your phone during taxi, takeoff, or landing. I know because until recently I was a flight attendant. I wore a Delta uniform and worked in a plane with a Delta logo. If you were a passenger on my plane, I would inspect your Delta ticket, give you Delta peanuts, and thank you for flying Delta. Announcements like this are an invitation to air-rage and a quirky byproduct of the Oct. 31 FAA decision. They’re also an expression of the elaborate subcontracting schemes that define modern American airfare. Here’s what’s going on. Before an airline carrier can implement the new PED rules, they must complete an FAA process that requires technical evaluations of the carrier’s fleet and revisions to their internal operating policies. Delta, along with JetBlue and American Airlines, rushed to be one of the first carriers to receive the FAA green-light. As Politico notes, each of these airlines had a seat on the 28-member panel that drafted the new rules. They may have benefitted from a head start. But like other legacy carriers, Delta outsources much of its domestic flying to regional operators, which now complete 50 percent of the nation’s commercial schedule, according to the Regional Airline Association. The regionals must apply independently before implementing the new PED rules. As Delta’s press release clarifies, about 570 “mainline” aircraft have secured approval. Around 550 additional planes that operate as regional Delta flights still await FAA clearance. 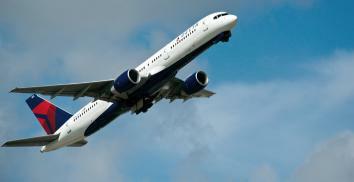 Delta expects its Delta Connection partners will attain an FAA blessing by the end of 2013. American Airlines announced a similar timeline for its regional brand, American Eagle. In the meantime, you’ll hear ambiguous announcements that allude to modern corporate outsourcing. But approval shouldn’t take that long, so does this matter? It’s a fair question. One Slate colleague asked me whether this was similar to the last days of prohibition: Even though alcohol was illegal, enforcement became lax. True—many flight attendants will stop enforcing the rules before their airline secures approval. I stopped enforcing this rule in 2011—flight attendants read Nick Bilton, too. Since I was expected to command the evacuation of a plane during an emergency, I worried about losing the respect of passengers by spending too much diligence on a widely mocked rule. But I have sympathy for my former colleagues at Endeavour and other regional airlines. Even though the old restrictions remain in effect on many of its flights, Delta is encouraging passengers to win first-class airfare by submitting photos from #Below10kFeet. This puts Delta’s low-wage, outsourced workers in an impossible position. Somewhere, a passenger is upset with a first-year Endeavour flight attendant who is trying to be as diligent as the FAA still expects, while making about $15,530 per year. Delta can’t have it both ways. If passengers are led to believe they are on a Delta flight, they should experience a standardized approach to safety and rules. Here, Delta’s marketing appears ahead of the FAA’s approval process. If Delta cares about safety, it shouldn’t fall to underpaid flight attendants to explain FAA approvals to Alec Baldwin. Correction, Nov. 6, 2013: Due to an editing error, this blog post originally said that Delta gained permission to implement new FAA personal electronic device rules on “Nov. 1 1.” It was on Nov. 1.